>>So Porsche has been testing at Monza this week (see the Twitter feed, see the FaceBook page, we've been chatting about it all week). Earlier in the week a Penske liveried RS Spyder was taking laps in addition to the 2014 LMP1. Suffice to say, Porsche is busy. And with testing occurring at Monza, the possibility of spy shots becomes a reality. So what's new? I've got to be quite honest, not much. It pretty much looks like the same car as four months ago (6.12.13 entry). This angle emphasizes the regulatory change for 2014 that allows the front splitter/diffusers to become purpose designed wing sections and note the witness of the wing's trailing edge (1). Analysis of the high res version of the image shows a leading edge gurney ahead of the BHH (2). And yes Antonio Pannullo, that IS a intake duct of some sort or another tucked in with the engine intake (3). The only thing that seems "new" is the cockpit extractor on the leading edge of the door (4). This is in reference to Art 3.3.2 which mandates a minimum area for cockpit extraction (40 cm^2). Not much appears to have changed from the rear either. You can really see the undercut nature of the engine intake (1), the undercut leading to that additional intake noted in the above image. The greatest mystery is still what engine configuration Porsche has gone with (2). But sources are indicating Porsche has gone with a 90 degree V4. No confirmation on capacity. And we get a slightly clearer view of the inner BHH on the rear fenders (3). There's still an expectation that the bodywork of the final car will evolve significantly. The first thing to mention is that in the scrum leading up to 2014 a lot of information is being held back . No one wants to be the first one out of the gate laying out what they think will be successful for the new engine formula, just in case that information is interesting to a rival outfit. But one thing has emerged that is somewhat interesting, if not tangential, is that since the Porsche's total power output is hybrid-supplemented (LMP1-H), the engine itself won't be tasked with producing as much power as say a privateer non-hybrid supplemented entry (LMP1-L). Therefore it's reasonable to assume the engines for the leading manufacturers will be of smaller capacity and that the engine capacity strategy for the privateer engine builders isn't necessarily one and the same as those manufacturers. So the Porsche engine will most likely be small capacity, and the suggested 2.0 liters passes the sniff-test. But what about cylinder configuration? Does a flat-4 make sense? Are there CG benefits? Turns out the answer really is no. You've got some difficult packaging issues to deal with, namely exhaust and engine intake routing, that compromise CG desires compared to a conventional 'V' (for example) configuration. 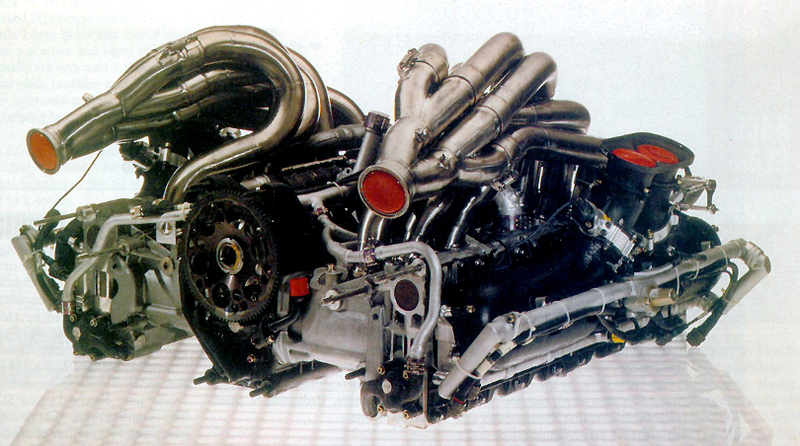 Given the small diameter of today's racing clutches, you actually would have to raise the crank height (and ancillaries) in order to provide clearance for the exhaust relative to the underfloor, or be forced to do something awkward with the engine intakes (recall the Mercedes C291 engine, image). I'm told that in the end, the flat-4 configuration is simply a non-starter for a serious LMP concern. And cylinder count? Sources indicate that given the small capacity the issue becomes capacity vs. cylinder count vs. resulting friction, and that a small 4-cylinder is within the envelope of consideration given those factors. So will the Porsche have 4 cylinders? For now I can't say without more information regarding the actual engine capacity, etc., but it also can't be ruled out. We have been working on the new 'fuel flow' rules LMP1 engine for around 2 years. The new engine is a clean sheet design that takes a lot of direction from the best features of our existing engines and developments and combines these features in a specific engine carefully optimised for the ACO / FIA rules. AER has also drawn from the considerable experience gained developing Formula 1 engine concepts for a major F1 team for new turbo rules F1. There are few direct comparisons to be made between F1 and LMP1, but some of the engine technologies are similar (high efficiency, GDI, fuel flow control, turbocharged, etc). As you know, we use the latest version of our I4 turbo engine in the ALMS (AER P90 GDI 2.0L) in combination with the latest Life Racing electronics. We use these engines and many others to verify and test components for the new engine. For 2014, we have produced a new 90 degree V6 engine the capacity of which, like the power and BSFC (brake specific fuel consumption) remains confidential. AER has made considerable use of a (now) very well developed turbo 1D model and CFD model in combination with very extensive dyno testing for verification of data. While Mike wouldn't be drawn into any power generalizations, he did admit that, "... we expect power to be better than hinted..." And ultimately, while F1 and LMP1 engine regulations appear in alignment, "I doubt if a real F1 (as opposed to one that looked “F1 like”) engine would be suitable as a Le Mans engine. For one, at 1.6L it would have to rev too high to be efficient and I expect combustion efficiency would be compromised by the necessary CR (compression ratio), etc."